LANGLEY — B.C.’s fastest schoolboy for 2018? His name is Kenny Blackman Jr., and on Friday, at the moment he knew the finish line was his to break, he spread his arms like wings. He felt so good he was ready to fly. 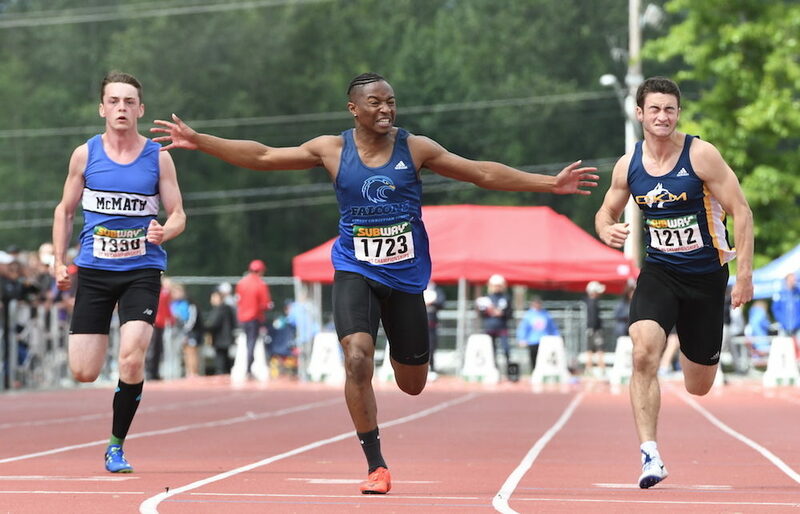 “Being the fastest in B.C., it’s something that means the world to me,” the senior from Surrey Christian said after winning the 100m senior dash at the B.C. high school track and field championships here at McLeod Athletic Park in a time of 10.89 seconds. Only seven other championship-winning times at the B.C. high school meet have been swifter in the 27 years since St. Thomas More’s Peter Ogilvie set the standard of 10.46 seconds in 1990. As well, Blackman Jr. is the first Surrey male to win the Percy Williams trophy this century, following Joel Nelson of Frank Hurt who won the race in 1997. On Friday, Frank Hurt’s Jesaiah Penson-McCoy took silver (11.10) while Alexander Gross of Okanagan-Mission was third (11.14). Blackman Jr. won the B.C. junior 100m title back in 2016, but says he wasn’t himself last season when he debuted in the senior division with an 11.29 seconds performance and seventh place finish. Next season, Blackman will begin his university career at Langley’s Trinity Western University. Oak Bay coach Atkinson: “I’m almost speechless…” Barbs first public school in a decade to win B.C.’s top-tiered rugby crown!